Aside from Cyclops and Jean Grey and Kitty Pryde and Colossus, the longest and most written about love affair in X-Men history has been Rogue and Gambit. So it's no surprise that Marvel Comics has just announced, via CBR, that the pair are getting a series of their own at last. The two have had series separately before, but it makes complete sense to put these two in a book together. So why are Rogue and Gambit so beloved a couple, especially to millennials? It really all boils down to the early '90s X-Men: The Animated Series, which heavily featured the ups and downs of their relationship. 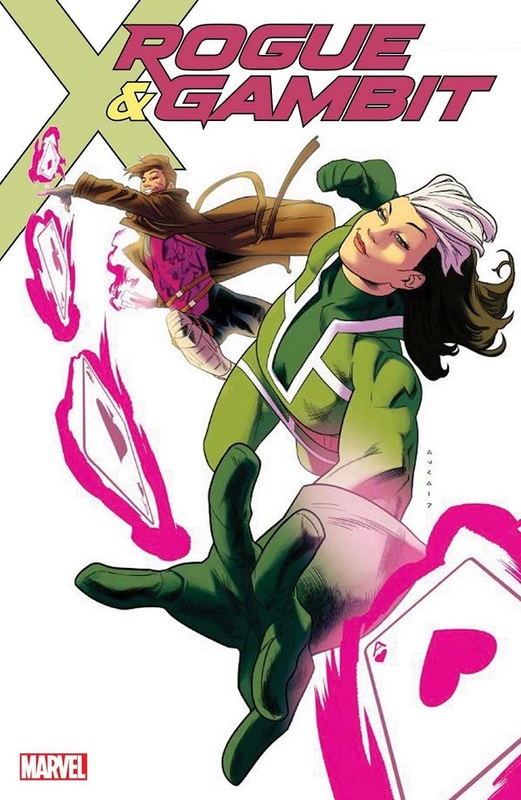 However, the Rogue and Gambit romance didn't originate in the cartoon series; it started about a year earlier in the pages of the comics, which were undergoing a sales boom. Chris Claremont and Jim Lee's X-Men #1 had sold eight million copies, and the flirtation between the two characters began in earnest in its pages. Rogue was introduced in the pages of Avengers, before becoming a regular member of Uncanny X-Men in 1983, and was the first new recruit to the team after Kitty Pryde. Back then, adding a new team member was a big deal--it didn't happen every few months. Rogue was originally a villain and a member of the Brotherhood of Mutants, but she came to the team to learn to control her powers. Visually, she was a very different character back then. Because of her inability to touch people, since she'd drain them of their life force if she did, she was covered head to toe in her costume. The X-Men didn't trust her at first, but she slowly became a part of the family. Gambit, on the other hand, was introduced some seven years later in Uncanny X-Men, in the summer of 1990. During this time, he had met an amnesiac (and de-aged) Storm, and the two became partners in crime, quite literally, in New Orleans, as both of them became high end thieves. When Storm got her memory back, she convinced Gambit to follow her to the X-Men, where he eventually met Rogue. By this point in time, Rogue was a much sassier, more confident character, and because artists like Jim Lee and Marc Silvestri were drawing her, she was also way more objectified. The early '90s saw issue after issue of a scantily clad Rogue in Daisy Dukes telling Gambit she couldn't be with him, because her touch would drain him of his powers and she'd hurt him. Then he'd argue back that she was worth the risk, etc. Since both characters were from the south, the constant arguing between the two was written in over-the-top Southern accents, and it read like a mutant version of Rhett Butler and Scarlett O'Hara arguing in Gone with the Wind. This was the basis for their relationship on the X-Men animated show, which is what millions of kids grew up watching. Eventually Rogue and Gambit did kiss--once when they thought the world was going to end. But she absorbed Gambit's memories and learned about some bad stuff he'd done years before, causing several more years of drama. At one point, both Rogue and Gambit lost their powers and were able to be together, but more drama ensued when their powers returned. Eventually, Professor X was able to help Rogue control her powers, and for a time, she and Gambit had a real relationship. The duo parted ways after that for various reasons, but it seems that these two characters are destined to always be linked together in the minds of fans. What do you think of Rogue and Gambit finally sharing a series together? Let us know your thoughts in the comments below. Make yours Marvel with these stories! Read some Venom casting speculation. Learn about Marvel's Old Man Hawkeye series.